Iconic. Legendary. Epic. World’s Best. Bucket List. Triathlon Mecca. The above adjectives largely contributed to the intrigue that landed me in the beautiful Bavarian countryside of Roth, Germany for the full distance Challenge Roth race on July 9th, 2017. Historical race photographs well captured the crowd blanketed energy, picturesque villages and countryside, and the scope of the enthusiasm among pro athletes, age groupers and spectators alike. 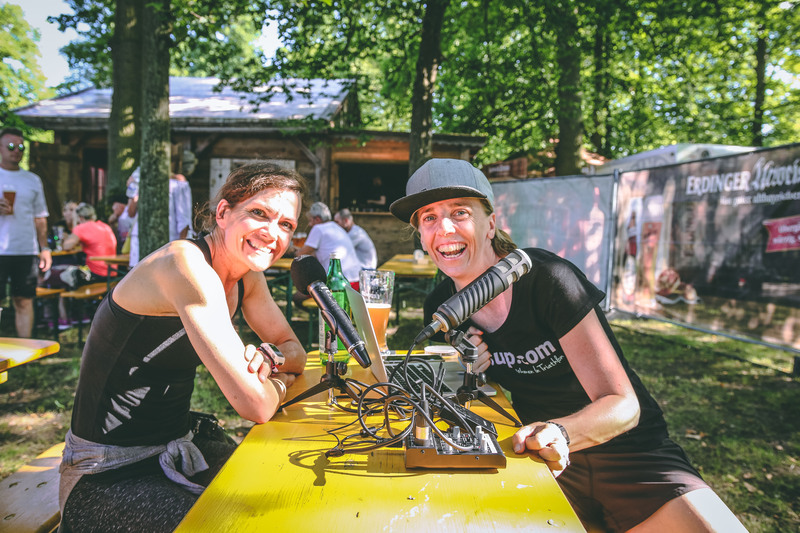 Within this quaint German rural town—a village of 24,000 residents—two hundred thousand dedicated course spectators halted all life responsibilities to invite athletes into their homes and showed up on bridges, hills, villages, to rally alongside the athletes. Perhaps more staggering were the 7000 (!) volunteers—young and old—who would line the notoriously fast course to lend a hand to the day’s success. 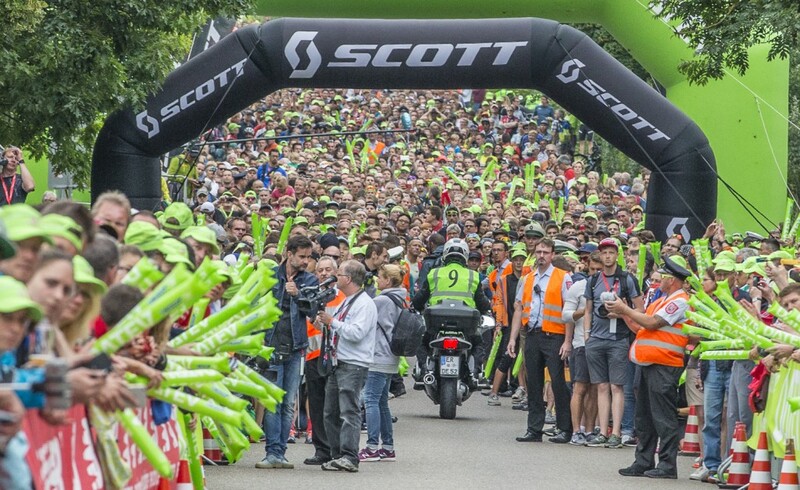 Imagining crowds lined five deep up Solar Hill—Tour de France style—while bashing long green and red noise making balloons together had this athlete’s blood pumping well before the gun would bang. My mind had been exclusively training on this course for the previous 6 months and had been in my heart for a year in the making. During the 2016 race, from my computer screen, I witnessed exceptional, thorough, non-gender biased live race coverage. Strict drafting penalties and the manner in which Challenge Family treated its professional athletes would be a new and humbling experience. It was a clear observation even from across the Atlantic, that Challenge Family took incredible pride in this race. That alone excited me. Training for the race was a joy. Coach Matt Hanson’s prescription of easy ‘Kenyan-style’ shuffle runs to leg-piercing, intimidating bike sessions were well accepted and grew the head confidence for a great training balance. Hard and easy, I loved every element of the build. 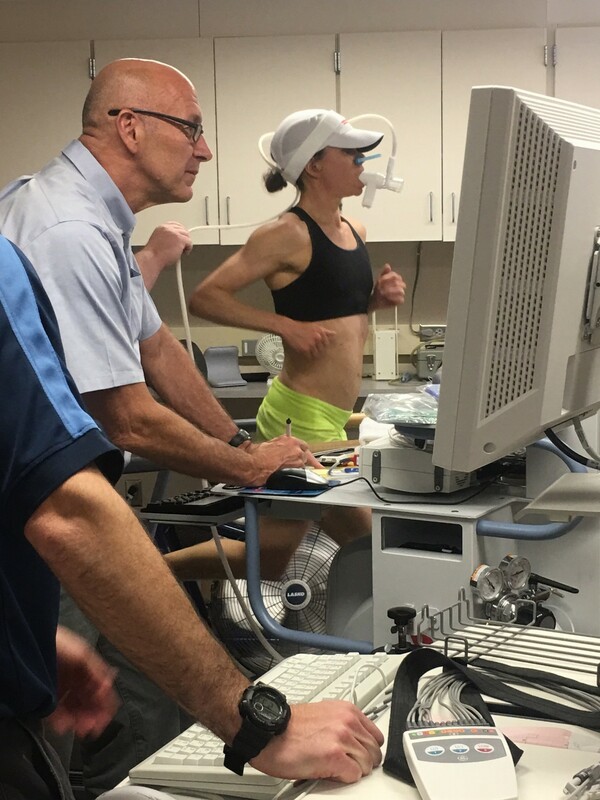 I heard the roaring Roth crowds during training rides on Minnesota county roads and in my sports bra, low hat, and dark glasses, I saw my world class competitors just ahead of me on the Mayowood running trail. I was motivated to catch these distant competitors until it became obvious that I was chasing a 70-year old brisk walker or a 6 year old kid on training wheels—sometimes a comical end. It didn’t matter, this was my mental race prep—well in advance, visualizing my race as though I was wearing Roth filtered glasses. My bike fitness was superb, my body was strong, and my swim was, thankfully, making gains and improving awareness in technique and confidence. Regarding my favorite segment of the race, I wanted to nail the run. I saw myself running the marathon of my life in Roth. Favorite advice and my new mantra: ‘Believe to see.’ My everyday image was my 41-year old self gradually passing my pro peers as I caught up relentlessly after the swim—the typical RBM game plan. My run, quite possibly, had never been better. Before any ‘real’ IM run training had even started, run economy lab testing in April suggested a stand-alone marathon pace I never thought possible (2:35-2:40, to which expert physiologist, Mike Joyner, humbled me with only an “above average” assessment ). My fastest ever half marathon run split at IM Monterrey 70.3 (1:18:04) in May further suggested that on a good day, I could possibly make my low 2:50 goal Ironman marathon a reality. Yes, it’s a 3-discipline race, but the run is when I feel most free. Mentally, I was on track as well. Laser focused. Balanced. Happy. Always, in my opinion and in my sporting arsenal of experience, the best gauge of where athletes are mentally hangs on their everyday happiness—their process happiness. Great mentoring and reflection has also hit this point home. Questions like…Are athletes adequately balanced in relaxation and anxiety? Are they focused? Are they mentally resilient? Are they able to withstand pain/discomfort?… are also good questions when assessing mental readiness for high performance. However, I’m convinced that the number one predictor of athletic success in the mental skills arena is genuine raw life happiness. There is no faking it. In May, three months prior, Monterrey 70.3 exemplified this belief. It certainly wasn’t a perfect race, but I felt alive. My run legs took over. I shut off my brain. I let my heart and spirit sing like it was my last career race. Big points were on the line for Ironman 70.3 World Championship qualification, but I allowed no pressure to interfere, and quickly trotted myself forward—catching, catching, catching—until landing a 4th place pro finish, a half marathon PB, and more than enough world champ points. The greatest takeaway came after the race when Mark observed, “I’ve never seen you run like that before. 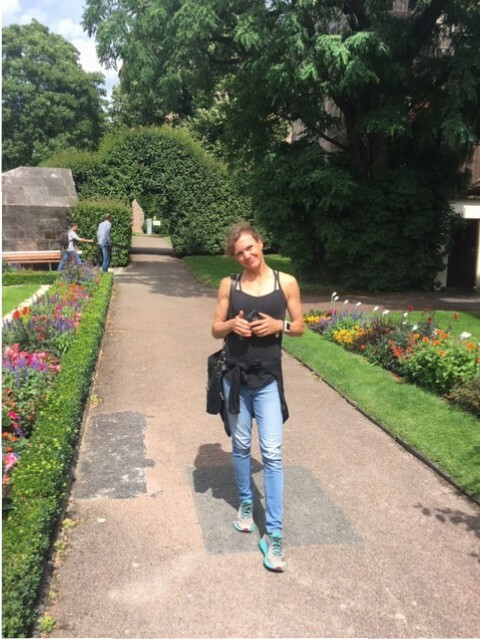 You looked….so happy.” I would take this ‘happy’ momentum with me into my Roth build up. Three weeks prior to Roth, my run training came to a screeching halt. 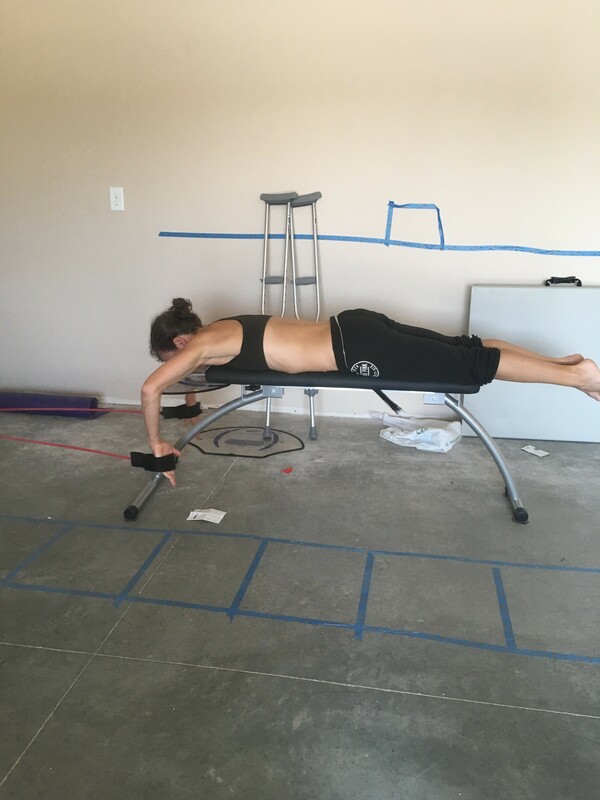 What started out as a very minor high hamstring tweak back in April during track speed work—which had seemingly resolved itself—would very periodically tighten up (mildly) and massage loosened it up perfectly. No big deal. 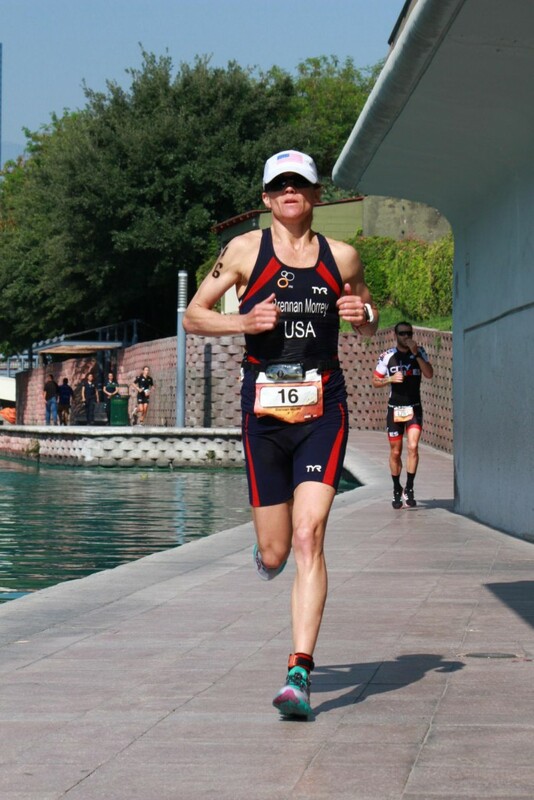 I continued to train pain free for 6 weeks, and enjoyed a fun filled race victory at Trinona Olympic distance without any hints of a hammy concern. We watched it closely and Active PT kept me healthy. Then an 18-mile long run in mid-June was self-selectively shortened at mile 16 after another slight twinge in the hamstring was apparent. I immediately shut it down. Again, rest and resolve—but back to seemingly 100%. No pain. 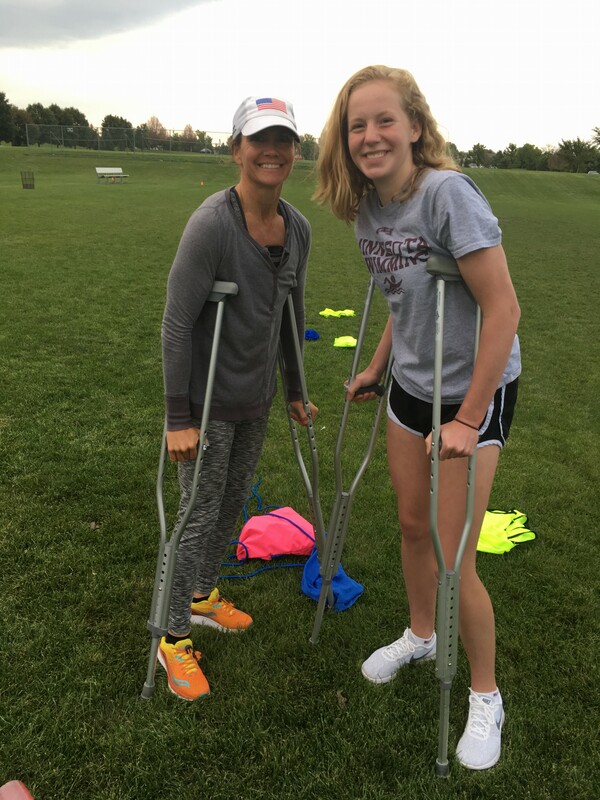 But it wasn’t until 3 weeks after that when I limped home midway from a 10-mile run with an unfamiliar sharp pain in my left rear end cheek (high hamstring, again) and I realized that something drastic was failing. Coach Matt quickly severed my run training and we rested. Thankfully biking load didn’t hurt it at all. At my age, I am smart with injury. I have no problem laying off. Matt was ultra conservative and took my lead. Eccentric strengthening, water running, and superb TLC from Active PT was helping tremendously. My bike fitness remained unscathed and the swim was unaffected. We would still make it to Roth. We decided to give it as much rest as possible leading into the race and give it a test at the last moment. I had no doubt that the race would happen. Zero. 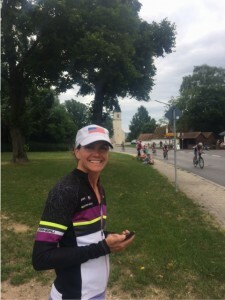 All systems were a go, the race course preview was complete, and Lisa Roberts and I strategized that ‘the two Americans’ would work together on the bike and run to give faster swimmers some pressure as we marched forward together til the day’s end. A 20-minute run test the day before the Challenge Roth was a heart breaker. Despite a strength-based physical therapy ‘green light’, dialing up the pace to just an easy 7:30/mi pace, the hammy still felt weak at the insertion and an eventual ache/flare up resulted a few hours later. Upon discussion with Coach Matt, it became an easy decision that the race I had been intimately mentally engaged with wouldn’t happen. Having traveled to Germany, the temptation to start and ‘see how it goes’ was quickly ruled out as an option. It would be foolish. Too much potential further damage was on the line. My injury advice to ALL has always been: Never bargain with an injury. Injury always wins. 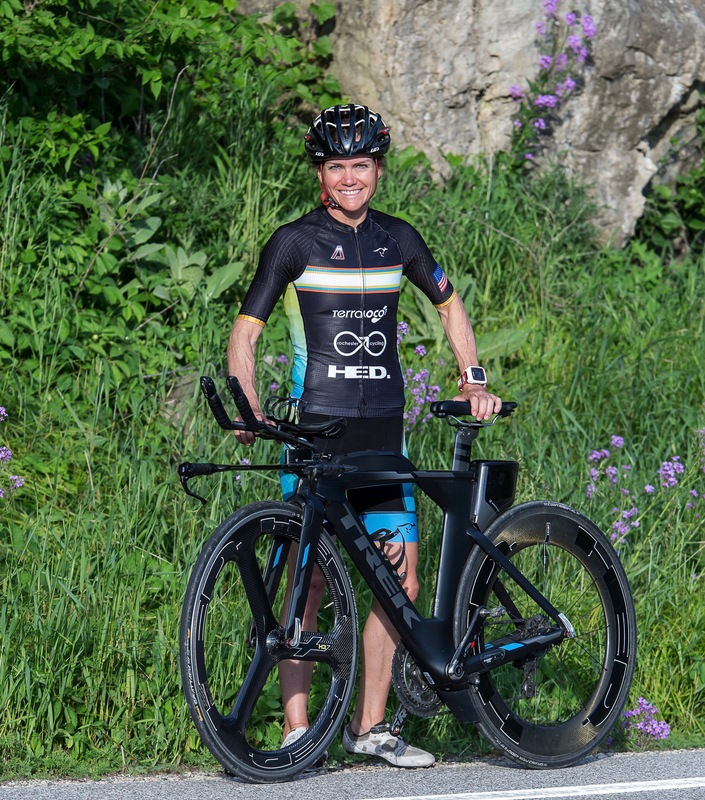 My heart sunk and the disappointment was thick, but the Ironman 70.3 World Championship race, a fall Ironman, and 2018 dreams were still on the radar. Hope and spirits remained. When I was age 23, my distance running injuries use to crush me mentally. My life walls seemed to cave in with such trepidation. They used to rock my world. This time was different. Despite not racing, I was still truly happy. My ‘raw life happiness’ was still intact and my attitude wasn’t defeated. Massively disappointed by the inability to have the privilege to compete, I remained at peace. 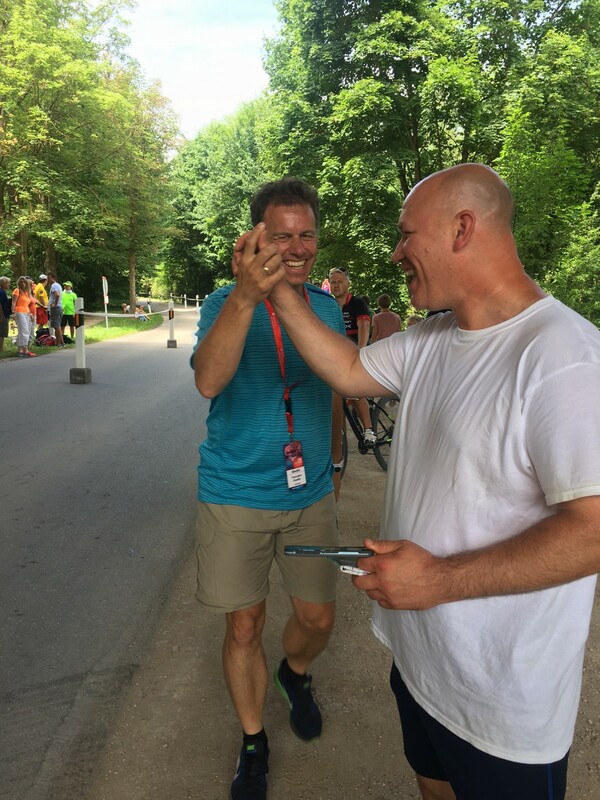 Mark, Thorsten, and I would eagerly watch the race unfold, enthusiastically cheer on the athletes, joke along the way, and take in the spectacular race energy that I had been dreaming about. Staying away from the race site or laying in bed having a pity party would have robbed me of experiencing the spirit of sport that was guaranteed that day—whether I raced or not. Waiting for Lisa Roberts and all pro females to whiz by! Convinced the injury was ‘almost there’, we journeyed back home, continued water running and resting for three weeks. The hammy then began tightening during bike sessions with an unpredictable course. Gah! Triple GAH! Pain free during bike sessions, but it was a bear the next day, and then another setback. As we know, pain typically serves as an honest feedback guide, and if we are smart, we listen. I was getting zero “STOP!” feedback until it was too late. Since we had minimal hammy resolve from strict ‘no running’ guidelines for 6-8 weeks, we then laid off biking altogether, and went in for an MRI. We gained a clear diagnosis and the reason why it wasn’t healing. Left side: Moderate partial hamstring tear (2cm) and proximal high hamstring tendinopathy. Right side: (asymptomatic!) Mild partial hamstring tear with mild PHH tendinopathy. The eagerly anticipated 2017 Ironman 70.3 World championship race on September 9th will also not be happening for my team. The future is always uncertain, but make no mistake about it, a full-fledged hefty RBM effort will be put forth to return as safely as possible. However, this injury is a real bugger, folks. It is relentless and unpredictable, often taking 15-24 months to resolve while re-injury rates are quite high. I have stared at this potential reality in the face. Reading, digging, and searching for ‘good news’ from other athletes about their high hamstring injury experiences was absent and the conclusion is this: this injury stinks and takes MUCH patience. 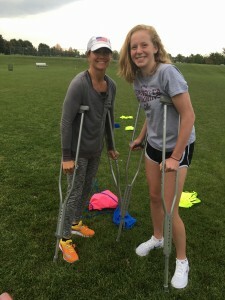 Two fellow rock star professional females fully empathized with the situation and stated they battled the same injury for 2+ years before finally kicking it. Surgery risks/long term complication rates are 20-30% (sorry, not an option for me! ), and there is no panacea treatment. A Platelet Rich Plasma (PRP) injection and 3 months of rehab afterwards is effective only 60-70% of the time, so it is not a guarantee. I’m almost 42 years old, and in two years time, I’ll be 44 (that’s good math ). The good news is that it WILL get better with time, but the bummer is that the aging clock is ticking, and there is no crystal ball for return to sport or the level of return. Running fast could be on hold for a long while. I just don’t know. Mark is a tendon doc—he doesn’t know. However, I have spoken to the right people in my life—those who give me hope, those who give me inspiration, those who believe in me, and those who know me well enough to ask me real world, smack in the face tough questions that I need to be able to answer. Last Monday, I elected to get a PRP injection with hopes that I am among the 60-70% who benefit. Some do, some just don’t—it’s a huge unknown, but besides it not working, the positive is that there are no risks. PRP will hopefully speed up the healing process and am currently I’m starting week two on crutches. It might be a long road ahead, or it might resolve as there is massive uncertainty to the progression of this injury, but still I remain realistic and I remain at peace. I acknowledge and accept whatever path is laid out ahead of me, and try to convince the Man Above that it is IN MY BEST INTEREST to run fast again—sooner, rather than later!!! Oh, man, I wish it worked that way. Accepting life on life’s terms can be tough. Truly, I just LOVE this sport. Much more improvement is possible. I continue to be grateful for the richness sport provides to me and my family. Whatever the outcome, I will remain happy. That is a guarantee. Anna, Sub 5min 500m 13 yr old inspiration! Halo Swim Bench Training while out of the game! So, when TerraLoco asked me to write this blog about handling disappointments, I thought I would provide some context. You have gotten a mouth/ear/eye full. I appreciate you hanging on for the advice bit! My entire being will be engaged in the rehab process with Active PT, the best rehab team available. I pray for a speedy recovery, but I also pray for full acceptance, patience, and discernment throughout the process. Full steam ahead. I am committed to turn disappointment into massive opportunity. DIVERSIFY YOUR IDENTITY. Your sport (or work) isn’t YOU. It certainly may be a major part of your life—your true life passion. But it isn’t who you are as a human. Make that distinction. At age 24, I let distance running success define me. Being injured was a threat to my entire being. The result was anxiety, dissatisfaction, and poor self-concept. Even when putting your heart and soul into your work, you must have self-worth and satisfaction in who you ARE, AND in other life areas so you are equipped for disappointment. If you are not injured, or not going through a hard time in life, start developing this NOW. Wait until you lose a job, or can’t compete, and it is too late. PROCESS IS NEVER A WASTE. Rumination about how I trained so hard for Roth, had incredible fitness, endless early morning sessions, so much time away from family, $ spent, and how “I don’t have anything to show for it”, is quite frankly, a load of garbage. Process is NEVER a waste. Hard work is NEVER a waste. Total and complete “ALL IN” commitment is NEVER a waste, even if you don’t have anything to show for it. Outcomes change your resume, but PROCESS changes your character. It is always worth it. HEALTH COMES FIRST. Let me say that again, HEALTH COMES FIRST. It is easy to say, but I see runners and triathletes rationalize, bargain, and train/compete when their bodies simply can’t handle it. It’s a privilege to compete and a privilege to train. Not only will training through pain/illness prolong our injury, but when we sacrifice our health for short term race goals we have simply lost perspective. EYES WIDE OPEN. When signing up for an event, novice athletes see themselves crossing the finish line, embracing family/friends, trinkets around the neck, and imagining glory filled happiness. This might be easily achieved for a 5k or sprint triathlon, but beginning an Ironman or marathon journey is different. You MUST expect and embrace injury, illness, ups, downs, everything. It is not all easy. In fact, most of it is hard. I’m guessing that many protective sport parents would yank their kids out of sport if their coach could accurately forecast all of the massive bumps that are inevitable. The rollercoaster of emotions is not pretty, but dang, that’s the richness of sport as a result of a genuine passion—expect and accept everything. All of the peaks and valleys create the most complete, most robust athlete. SPORT IS THE GREATEST RESILIENCY TRAINING. The ability to bounce back is learned through failure. You cannot read about resiliency, or be told by a coach that you need to be resilient, then neatly apply it to a disappointment. It doesn’t happen that way. Having failed time after time—for many reasons (! )—in three sports at a very high level has been a long-term blessing. My passion and “care” for sport hasn’t changed, in fact, my value for sport to become my very best self has grown exponentially, but I’m able to bounce back faster because of failure/disappointment. CHOOSE YOUR SUPPORTERS/SPONSORS CAREFULLY. I can hardly believe my ears when fellow triathletes talk about being pressured to race—through injury—due to sponsor pressure. Who stands by you in the trenches when you are going through the tough stuff or life change stuff? Who can you call in a moments time, get real and honest advice, full acceptance without judgment? Genuine friendship/mentorship/sponsorship built throughout the years always have your best interest in mind. I’m supremely humbled by my posse’s commitment to me as a person and my athletic endeavours. GET OUT OF YOUR HEAD. If your body has failed, your mind can still be polished. Be present, be mindful, pay attention, and calm the head and body like it is your new job. Read, go for a walk, study your sport, control the controllables. Don’t let your mind do what your mind enjoys doing: creating problems that don’t exist. Notice and polish your thoughts. Keep a positive, task-oriented, yet realistic framework between the ears. STAY ENGAGED. Disappointment can naturally change our social circle. Balance independence with support seeking. Stay engaged. Not only GET support, but GIVE support. Life—even when going through the worst disappointment—is not all about you. ‘Giving’ will provide you more than ‘getting’ anyway. OPPORTUNITY AWAITS: At the beginning of the year, my number one goal was to improve the swim. Even before a dreamy Roth WIN :-), my goal was to have definite swim improvement and increase my swim awareness. Whether I get back in 4 months, or get back in four years, this challenging part of my world will continue to be a goal. One v one instruction, group competition, slowing down, improving swim self-awareness will continue to be my life goal—well beyond my triathlon years. The swim is the most intriguing and most motivating part of triathlon for me, and now I get to swim more . Use the opportunity to hone your weakness. 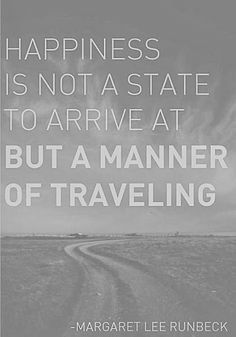 NEVER NEGLECT YOUR HAPPY PLACE. Where do you go for strength? What do you fall back on when you are disappointed? Simply, GO THERE OFTEN. Whether its nature, prayer, family, music, alone time, social time, reading, etc. When you are finished, GO THERE AGAIN.